They did, however, leave an exciting beast behind, in the form of one of Surly’s new, Rohloff and detailleur compatible Troll framesets. Surly have a reputation for building solid, versatile, no-nonsense bicycles, and I’ve always admired their non-conformist and zany attitude. Back at home I ride one of their Big Dummies, a long wheelbase cargo bike that gave me the excuse I needed to sell my van. So why the change? I’ve been riding the Thorn Sterling for 15 months and it’s going strong. Apart from some cable wear, the odd scratch and and my weather-worn stickers, the frame still looks almost as good as new. You can read more about what I thought of it here. 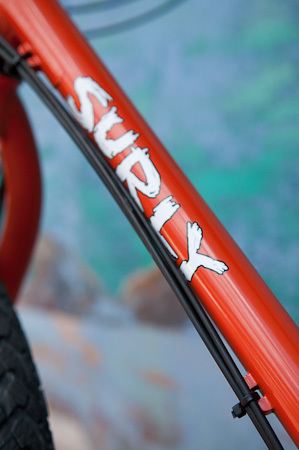 But when the opportunity came up to write a review of the Surly for What Mountain Bike, it was hard to turn down, especially for a bikenut like me. 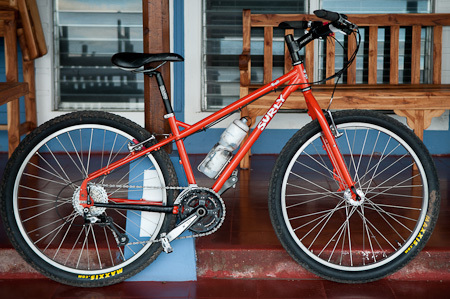 Although based on their singlespeed 1×1 frame, I see the Troll more as the mountain biking, muscled sibling of their popular Long Haul Trucker. It’s just been unleased into the world and offers a few key features that cry out to the adventure touring fraternity. Update: check out the gear and wheels pages for more on the Troll. Not only did Megan bring a frameset for me, she also brought a complete bike to tow her daughter Neva - dig back a few posts for some pictures. This is her 14in frame, built up with derailleurs and a Phil Woods wheelset. 'Oops' for leaving it in that painful crossed over gear! Seen here with her Chariot trailer, and little Neva. Troll, n: A supernatural creature of Scandinavian folklore, variously portrayed as a friendly or mischievous dwarf or as a giant, that lives in caves, in the hills, or under bridges. What’s the big deal then? Well, not only does the Troll boast monster tyre clearances that will happily munch up 2.7 inch rubber, but it can also run a standard rear rack with a disc caliper, thanks to its nifty placement between the chain and the seat stays. I’m hoping that a combination of these two factors will help reduce the intense mud clogging issues I’ve experienced in the past. For the same reason I’m also moving over to Avid BB7s, a disc brake I’ve toured with before; they’re mechanical in the name of simplicity and low maintenance. There’s a bunch of other features I’ll go into at some point, including an MTB, suspension ready geometry and eyelets for full racks and mudguards. You can read more about these here. As ever, check the geometry charts to see what frame size would suit you. I considered trying the largest, a 22in, but ultimately opted for the 20. Compared to my previous steed, I can make up a slight shortness in the reach with a stem that’s a centimetre longer. A frame that’s a touch smaller promises more stiffness for load carrying, and tighter handling when unladen. Salsa’s A La Carte has a similar geometry and its sizing chart is useful. 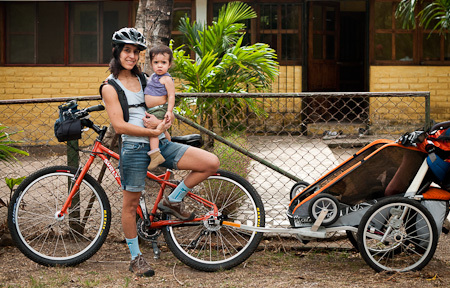 So, here’s a quick lowdown on what I put together with the help of a multi tool, a hammer and a block of wood, under the blazing hot Costa Rican sun… Feedback on how it rides fully laden will be coming soon. Old parts, new frame. Everything moved from the Thorn Sterling, including my Rohloff and wheels, keeping this transformation cheap and easy. Surly's fork positively devours the Marathon Extreme 2.25in I'm running up front. This bodes well for mud clearance, especially when I fit the BB7 mechanical disc brake that will match the rear I've already mounted. The Troll has sliding dropouts and needs an OEM 2 plate to anchor the Rohloff in place, rather than using a mini torque arm and an eccentric bottom bracket, as seen on the Thorn. It's not quite as quick to change the wheel as a Rohloff specific dropout, but the plus side is that it's more versatile. The large eyelet at the back is for Surly's two wheel cargo trailer. Seeing as the Troll isn't a Rohloff-specific frame, I had to share the cable guides between the rear brake and the Rohloff to run them on the downtube, which is my preferred routing (rather than along the top tube). Still, the end result is neat and works well. Like the Sterling, the Troll's not designed to be a dedicated touring bike, so unfortunately there's no provision on the downtube for a third water bottle, which would have been really useful. 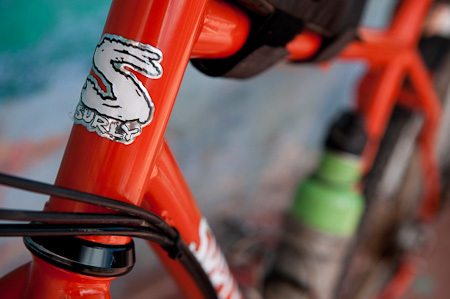 Surly's mini triangle offers extra top tube clearance. Hopping on and off the bike when its fully loaded is easier this way. Unfortunately it reduces space for a framebag, though the 20in frame I chose should be roomy enough. With typical Surly black humour, the Troll is finished in bright, punchy Agent Orange. Perhaps it's a little eye catching out on the mean Central American streets, but there's no denying it looks great, and will stand out a treat in photos. Chelsea and her wrinkles. 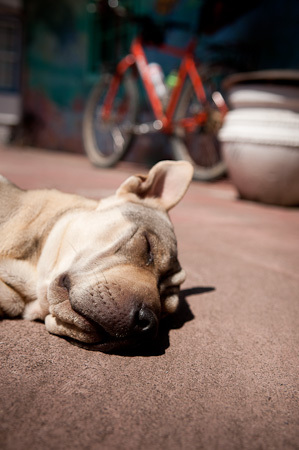 She kept me company during the build, out in the courtyard of the hostel. Thanks to Ciclo Deportes Moreno (150 Oeste Museo Juan Santamaria) for their help. 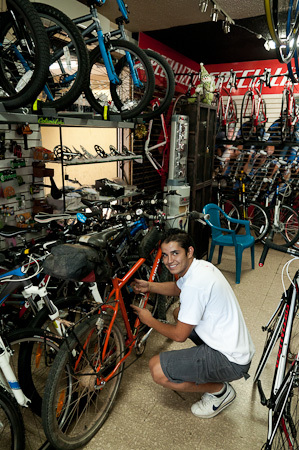 This is the bigger and better stocked of two bike shops in Alajuela, and is very close to the laid back and quiet Mango Verde hostel where I’m staying – which has a massive open courtyard for bike fettling. April updates: you can read more about the Troll battling through glorious mud here. 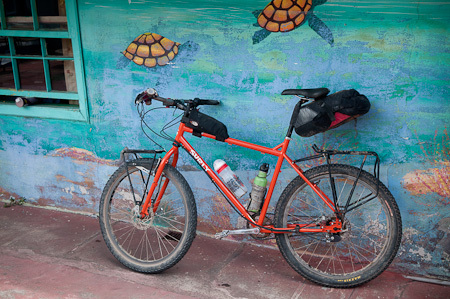 This entry was posted in Bike Talk and tagged review, Surly, troll on February 23, 2011 by Cass Gilbert. 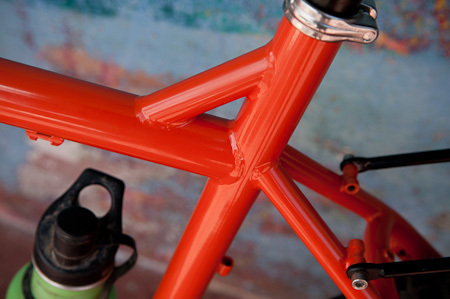 Apparently their meaning of troll is a little more common Cass; the name of the color of this frame, from the Surly web site, is ‘agent orange’. Beer is queer. Be real, be sober. Indeed, Agent Orange. Other classics include Skidmark Brown and Truckaccino, for the LHT… I like the way Surly have fun with their names – Big Dummy and Karate Monkey make a change from the usual unimaginative offerings. But how could one better “Sterling”, a fine sign of quality?? Hi Big C, Just wondering how often are you needing to change your Rohloff cables? Just started reading your blog a couple weeks ago. Looking through past posts and am loving the diversity. I recently acquired a Troll as well so my interest in how yours is treating you will make your posts that much more interesting. Thanks to your inspiration possibly Central America for me next now the Andes is all finished.. just waiting for a flight out of Ushuaia now. Hey Cass, Good luck with the new Marathon “Extremes”. They were designed and built for what we do, but I think they need to go back to the drawing board. I’ve had two of them shred apart from the inside. The cord structure they used is really not very strong. I never even took them up to max air pressure but soon bulges appeared in the casing. Silke, the woman traveling with Ana K. also had this problem with the Extremes. Schwalbe warrantied them for me no problem but as you know shipping is a huge pain in the neck bone, to where you are. I just wanted to give you a heads up and try and keep your pressure on the low side. Happy Plowing! Thanks for that Kurt. I´ve been running Extremes on and off for a while now, since Alaska, and I haven´t had any major issues like that. They definitely don´t last nearly as long as the XRs, typically I seem to get 3-5000kms out of them depending on terrain – then the inner casing splits, or the nobs rip off – not had bulging though. I ran them at max tyre pressure most the time though; they seem to wear pretty quick at the back, but last way longer up front. The front I have now has been on since Guatemala at least, though I do travel pretty light. I´d prefer to be running an XR at the back, and an Extreme up front – if they were still around. 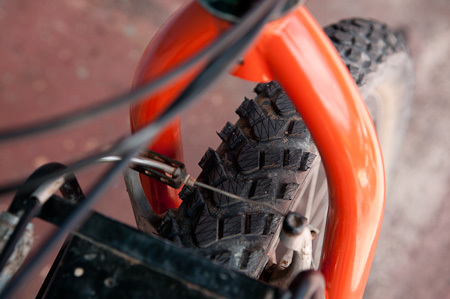 The XR was a far superior tire as far as longevity. I put 8,000 miles on a single set on a previous trip (yes, I was riding on the puncture protector for a while, but still). It Really is to bad they have been discontinued! I just got some of the last 26×2.25 XRs from Schwalbe. My first Extreme that went bad was on the front. Weird Huh? As we know its the rear that takes all the abuse. My rear went later. This was all in a relatively short distance, between Pie Town (where I mounted them new) and Oaxaca. Granted this was mostly off pavement but still ridiculously short for an “Extreme”tire. Whoa this got longer than I meant, Good luck with you and yours! Why the XR was discontinued is a complete mystery; they were a classic and I was sorry to see my last set wear out, finally. I can see a place for the Extreme – after all, they’re a few hundred grams lighter in rotational weight, which is great for slimmed down, dirt road touring and singletrack side trips. But not as a replacement for the XR. Perhaps they should be called something like the XR Lite, so you know you’re getting a tyre that’s not going to last as long – especially given the price they are. Schwalbe’s range is a little confusing at the moment, with the neither the Extreme or the Dureme (similar weights) offering an obvious alternative to the XR. Incidentally, while we’re talking about tyres, I’ve tried the Dureme too. Noticeably faster rolling on pavement, but max size is 26×2.0, and it comes out a good deal skinnier than you’d expect. I use it as my spare, or when I’m hitting a longer stint of pavement. It is indeed a sweet ride (-: And handles weight nicely too. I did consider a Pug fork, which might work with a 100mm suspension corrected frame. Loved your post. I am building up a Troll that should be similar to your with Rohloff speed hub and disc brakes. What hub model did you use? I want to use quick release hubs–is this Ok with the chain tension? I was going to use a surly mr whirly crank and hopefully this will maintain the correct chain line. I would apreciate any advise you might have to get the best results possible. In case you’re not quite ready to move on to another tire, I’ve recently unearthed a secret over-stocked stash of XRs (of the 26×2.25″ variety)! The Troll looks great; the rear drops make for such a tidy setup. Well done Surly! Greg, yes, certainly interested in those XRs… My Extreme is holding out fine, but an XR at the back would be ideal. Mkf: not sure the hub model. The one with discs and EX box. It’s pretty old, about 8 years. Use a cheap, simple, steel skewer. I bought a generic Shimano one ($8) and this to be fine, I just need to crank it down nice and right. The Salsa Flipoff I had couldn’t do the job though – maybe the plastic piece prevents it from getting so tight, or maybe it’s my skewer that’s a little out of shape – it’s several years old. I’m now running some cheap Shimano Alivio cranks, with a 118mm BB (I think) and the chainline is pretty good. Cass, I’m getting ready to place an order for a couple 2.25 XRs. Not sure if it makes sense to order an extra (or two) for you and forward it along or if you’d rather handle it all yourself. Let me know either way. Congrats on the new bike! I have a Sterling for off road touring and am now thinking of building up a Troll with an Alfine 11 for commuting and rough stuff. Should be interesting to hear how you get on with it, would love some comparisons with the Thorn! Lovely!! I would also like to see a comparisons with the Thorn.. Since I have my eyes on both the troll and sterling but can only choose one as my new bike! The cable quides are meant for three cables, one on each side of the guide. from what I can see, the cable guides are indeed meant for three guides on the top tube, but not the downtube. I find it makes for a neater cable run and lighter shifting to run it below. Really love the blog, the scenery is so colorful, makes the states look bland in comparison — must be fun! I bought the handlebars from Speedway cycles in Anchorage (http://fatbackbikes.com/) but I don’t see them online, so you might need to drop them a line. Great bars. forgot to add this, but what handlebars are those?? I was also slap bang between sizes. I don’t have my measurements to hand, but I opted for the 20, over the 22, for a stiffer frame and more top tube clearance. I still need to source a stem that’s 1cm longer or so, to make up for a slightly shorter reach. The handlebars are from Alaska, bought at Speedway Cycles (http://fatbackbikes.com/shop.php) who also build Fatback bikes. I don’t see them on the site, so you might need to drop them a line. Great handlebars, lots of sweep, and very comfortable. I’m planning a trip across South America and want to build a Troll bike. Since your trip looks similar to what I want to do, do you have details of specs somewhere you used for your build? I couldn’t see this on your website, sorry if it’s there somewhere. Would really appreciate it, finding it tough to decide and not that familiar with the components. Thanks Cass, very helpful. I thought you may have a summary/list somewhere but think I’ve learnt a lot reading through your notes anyhow. It’s a steep learning curve for me! Do you favour disc brakes a lot higher than V brakes aside from the issue concerning availability of spare parts in developing countries? What would you go for if you had to take only either V or disc to South America for the Troll? (understand you’ve got both?) On balance I’m thinking it probably won’t make that much difference but disc could be useful in seriously muddy conditions. My other concern: probably not going for a rohloff to save cash but still want the bike to be as tough as possible; for durability, do you reckon the Shimano XT would be the optimum choice for the cassette / crankset etc? Or is e.g. Deore, SLX adequate? Thanks again. When are you heading to South America? 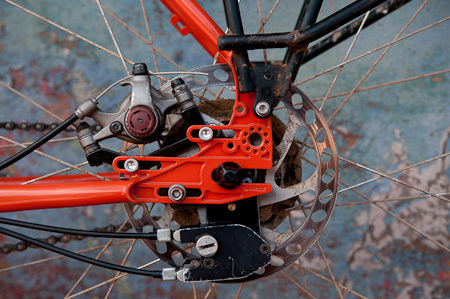 There’s nothing wrong with V-brakes at all – simple, reliable, light. 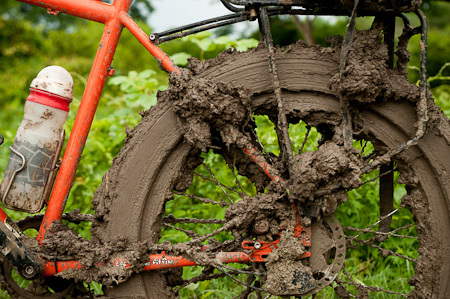 Personally, I like discs for their extra mud clearance and the savings they make on rim wear. I don’t think spares are such an issue these days – every high end bike shop in almost any major city in South America will have pads and discs. It’s best to remove the discs when boxing the bike, but I have to admit I’m lazy in doing this. I set my bike up to run rim brakes originally (the Santos I set off with didn’t have disc brake tabs), and despite the extra price I can really recommend CSS-coated Rigidas, teamed with Swiss Stop blue brake pads. Incredibly, there was almost no wear after some 20 000kms of use, and I’ve read similar reports on other blogs. If I was starting afresh with discs and a standard drivetrain, I’d go with something equally burly but cheaper, like the Rigida Sputniks. I like SLX. It seems to inherit a lot of XT’s technology for a cheaper price. Bear in mind outboard bearings don’t typically last as long as square taper ones, unless you upgrade to something fancy like Woods – which are cool as they can be replaced without a specialist tool. Any tips on wheel hubs? No worries if not. Was going to just go Shimano XT but saw a couple of negative reviews which concerned me. So now thinking something like: Hope (Pro II) or Phil Wood. Basically don’t want to be stuck in the middle of the wilderness in Alaska on my own with a seized hub. I see you did the Pacific Coast Trail? What was the deciding factor between that and the Tour Divide? Don’t want to take over your blog! so feel free to email directly any time if you prefer. I couldn’t find the Rigida website (I’m sure it used to be there…) but I’m sure the likes of Spa Cycles have plenty, or can advise otherwise. No issue with XT myself, but I do like good quality sealed bearings for their simplicity – no fiddling about with cone spanners. In the unlikely event you need to change them, you generally have plenty of warning. I’ve been very happy with my Hope front hub, less so with the Chris King – broke at the flange twice. I’m sure Phil Woods are the business. Maybe quieter than those clikety clikety Hopes too. Awesome; can’t wait to get out there. Did you do the full Pacific Coast Trail? Or just sections? how does it compare? Planning to cycle across Alaska and Canada too; do you know of any major trails there that cross the state / country similar to the Tour Divide? Doing it on road at the moment mainly for lack of local knowledge. Thanks for the link. I’ve never had an issue with XTs before, but it’s worth either being comfortable with keeping them serviced yourself, or knowing how they feel when they get loose (I just hold the wheel and waggle it from side to side to see if I can detect any play) so you can take them into a mechanic. Otherwise, you risk damaging the races. Being used to running the Rohloff, which has such reliable bearings, I forget what life is like with derailleurs. I’d definitely go with a rear hub that has a Shimano compatible freewheel. I wouldn’t bother carrying spare bearings myself, but it might be worth buying a set and having them to hand, so a friend can send them out if need be – just make sure you leave plenty of time for this. There’s no continuous trails across Alaska and Canada that link up with the Great Divide. If you look in the route section, you can see some of the dirt/gravel roads and singletrack I managed to find on my south – like the Kenai singletrack loop, the Haul Road, the Denali Highway and the trails around Whitehorse in the Yukon. Meant to say thanks for your responses; also I saw you put up a summary of your Surly Troll build which is very helpful. My LBS is putting on a 22-32-42 front crankset (SLX) with 10-speed cassette (20 inch surly Troll). My concern is that the 42T chainring isn’t high enough for high cruising speeds for a long tour (loaded). I think 22T is great for when heavily loaded on steep inclines, but what crankset spread would you suggest? Understand you’ve got a rohloff but any thoughts would be appreciated. Is a chainring something I can easily swap out at a later stage? I’ve always run a standard 22-32-44 mountain bike triple. People run 46T and 48T for touring, but for the kind of roads I tend to ride, I don’t find myself in the very biggest gear combination too often. 44T seems to be enough for me. It’s very much down to personal preference. I think I’d prefer a 9 speed chainset over a 10. Although it’s likely 10 speeds are becoming more available in Latin America (at least in good bike shops), 9 speed is probably prevalent – and cheaper. All things being equal, I think the chain might be a touch stronger, and the gears easier to align. I’m not sure if you can get pinned or ramped steel chainrings, but they should last longer than aluminium ones. The coated Middleburn chainrings tend to do well, so you could get a middle and outer of those ready for when the Shimano ones wear out. Thanks again for the quick response Cass; so helpful! You are literally an encyclopedia of bicycle knowledge. It’s actually been a bit daunting building a bike for a major trip like this with zero experience; people like you are a real saviour for my sanity! I have a troll that I’ve been using for a few years and I love it. I’ve only carried rear loads or in a relevate frame bag. How did it handle with the front loaded up like in the one picture? I found the Toll handles better with a front-centric load. I had a gnarly shimmy on a part of the Great Divide, which might have something to do with a rear-centric load. It’s interesting to go back in time so see where you pivoted from a “traditional” touring bike to a Troll, before going farther afield in the off-road world. I have a Troll hanging next to me, what I’ve had for a couple of years now. It’s the last model of the “old” design — suspension-corrected frame, clearance for a mere 2.75 rear tire — and it’s served me very well. My frame being a small, I had to get creative to make up for a smaller frame bag. I bought an aluminum Salsa rack (I believe it was your advice not to get the massively overbuilt Surly steel rack) on which I hang Revelate Micro Panniers, replacing Arkel Drylites, which I never really liked. So far those wonderful, small panniers have only done doughnut transport for “Coffee Outside PDX,” but I imagine they’ll be properly tested soon enough. The Surly 8-Pack Rack has been miraculous. 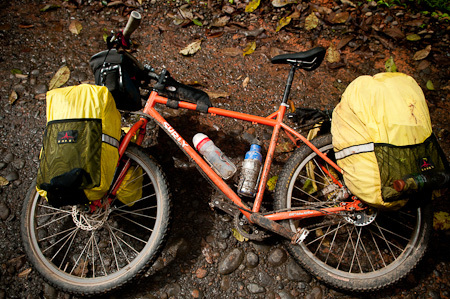 When I see bike reviews or articles about bikepacking rigs, I often judge the “value” of a bike based on weather it can take a Surly rack. On my last trip from Seattle to Portland over gravel roads, I used a Revelate Harness and (red!) Periphery Pocket, but I had it resting on the rack, which also serves K-Lite mounting duty. It now has a basket on it. I can’t see replacing this Troll any time soon, although if I did, it would be for a newer model to take advantage of the updates.